Only one game for you this week. It is also one we have seen before like last two weeks. So again I decided to edit the original article. 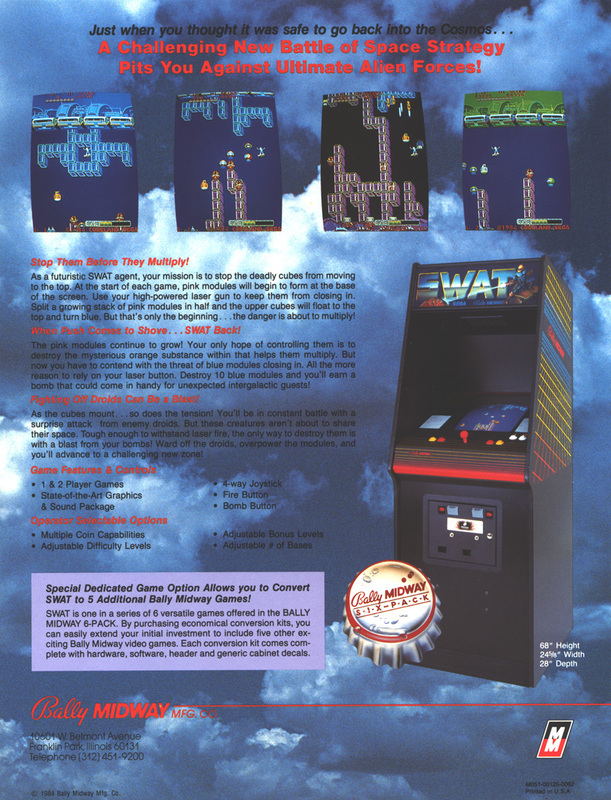 SWAT was developed by Coreland and was released in 1984. 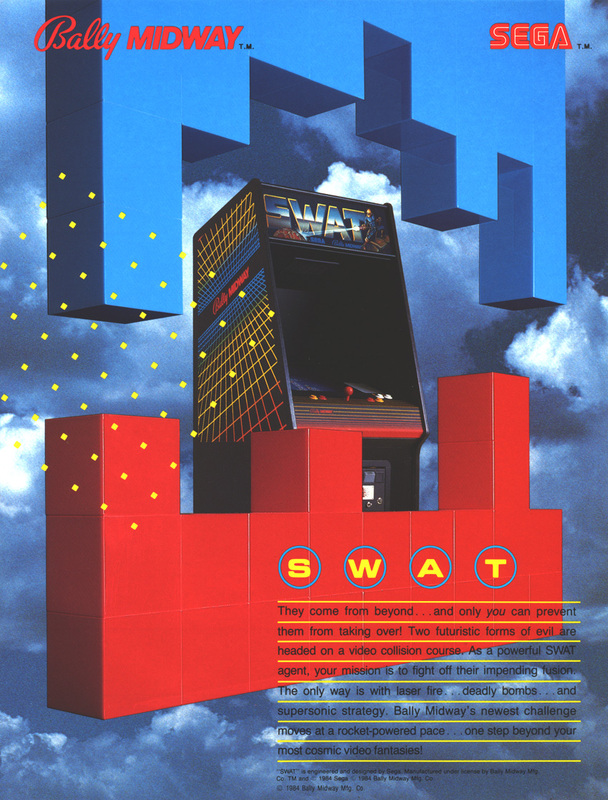 SWAT is an abstract shooter in which you play as a futuristic SWAT agent. Your task is to stop the impending alien fusion, which is happening in your city. The enemy are trying to build a network of tunnels to the city to complete their mission. For you to defeat the alien invaders you need to kill all the Blockers that are building the tunnels. You have two weapons at your disposal the first is a laser gun which you use to kill the Blockers, Expelers, and to destroy blue tunnel units. The second is your deadly bombs, which will kill everything in a small area including the Anngrers and even yourself. There are two types of tunnel units, the blue and the pink. The blue tunnel units are able to be shoved to re-align them and destroyed with your laser. Destroying ten blue tunnel units will reward you with an extra deadly bomb. The pink tunnel is unable to be destroyed by your laser or your bombs, they are only able to be shoved. If you shove pink units away so they become unconnected to the alien base they will turn into blue units which you to destroy. If the aliens do succeed in connecting the tunnel to the city a new enemy called Sweepers will appear, also fire will start raining down on you. This will make things a lot more difficult and the tunnel needs to be disconnected as fast as possible. There are seven different starting tunnel layouts, each being more complex then the last. Once you have completed the first seven rounds the tunnel layout cycle back to the first one, but increases the speed of all enemy units.